Explores the vivid life and imagination of Stan Lee, from the early days of his Depression-era upbringing through the Marvel Age of Comics and beyond. 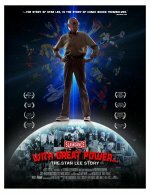 With Great Power: The Stan Lee Story release date was Wednesday, May 2, 2012. This was a Limited in theaters release. Arguably the most recognized name in comics, Stan Lee has co-created over 500 legendary pop culture characters including Spider-Man, Fantastic Four, X-Men, Iron Man, Thor and The Hulk.